Bluebird Class Motor Minesweeper: Laid down, 20 July 1953 as AMS-191 by the Quincy Adams Yacht Yard, Inc., Quincy, MA. 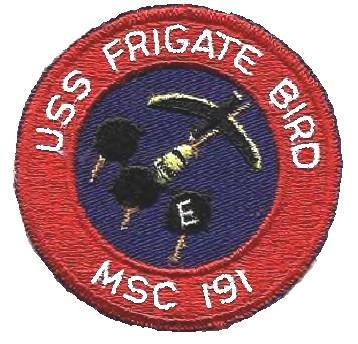 ; Launched, 24 October 1953; Commissioned USS Frigate Bird (AMS 191), 13 January 1955; Reclassified as a Coastal Minesweeper, MSC-191, 7 February 1955; Transferred to Indonesia in 1971 as Pulau Atang (M 721); Struck from the Naval Register, 1 May 1976; Disposed of through the Defense Reutilization and Marketing Service for scrap, 1 September 1976. Specifications: Displacement 290 t.; Length 144 3"'; Beam 28'; Draft 9'; Speed 13 kts; Complement 39; Armament two 20mm; Propulsion 600shp Packard diesel engines, two shafts.